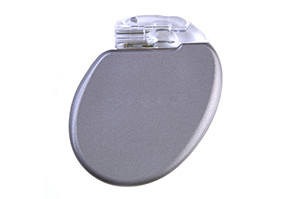 What is an implantable cardiac defibrillator? Your Cardiologist/Electrophysiologist may have referred you for an implantable cardiac defibrillator. These devices are usually indicated for patients at risk for lethal fast heart rates referred to as ventricular tachycardia (VT), ventricular fibrillation (VF), cardiac arrest, sudden cardiac death, or ventricular tachyarrhythmias. Consists of a metal device which houses the battery/electronics and one, two or three leads which either pace or shock/defibrillate the heart. The leads are placed in various chambers within the heart. The ICD will shock or defibrillate your heart if you have a lethal ventricular tachyarrhythmia or sudden cardiac arrest. All ICD’s are also full functioning pacemakers and provide back-up pacing. The devices are typically two to three inches in diameter and ½” thick. ICD’s are most commonly placed in patients who are deemed to be high risk patients for sudden cardiac arrest. The majority of these patients have ICD’s implanted prior to their first event. Most patients have weak hearts due to either prior heart attacks, or may have weak heart muscle for various reasons. Some patients may require ICD’s if they have a condition referred to as Hypertrophic Cardiomyopathy or long QT syndrome. This is a congenital disorder and typically affects younger patients. Making a 2 inch incision in the chest region. Surgery takes approximately 90 minutes for one and two lead systems. May take up to three hours for three lead systems. Anesthesia: Local and conscious sedation (twilight). The leads are threaded via either the subclavian/axillary/cephalic vein to the heart. After the ICD is implanted the dressings should remain on for up to four days. You can shower once the dressing is removed, but tub bath or sponge bath until then. There should be no lifting the affected side above the shoulder for one month, and no lifting greater than five pounds with the affected side for one month. We encourage patients to be very active once the ICD has healed. You should carry the ICD ID card with you at all times and inform any medical professional that you have an ICD. You should also inform security when walking through a metal detector that you have an ICD. Walking through the metal detector will not harm the ICD. ICD’s are not compatible with MRI scanners. You may have X-rays, CT scans and stress tests. You may also use a microwave with an ICD. ICD’s should be followed up either in our clinic or at your cardiologist's clinic every three months. Most ICD’s last 4-6 years, however actual longevity may vary based on usage.